Renewable energy sources like solar and wind can provide plenty of investment opportunities, but also volatility. The early December U.N.-sponsored climate change talks in Peru may have led some of your clients to wonder about investing in renewable sources of energy. If so, they would be joining the likes of Warren Buffett, who has poured $30 billion into this business. The relatively young renewable energy market is made up of a number of different subsectors, including solar, wind, hydropower, biofuels, geothermal and energy efficiency. Of these, the most significant are wind, solar and energy efficiency. 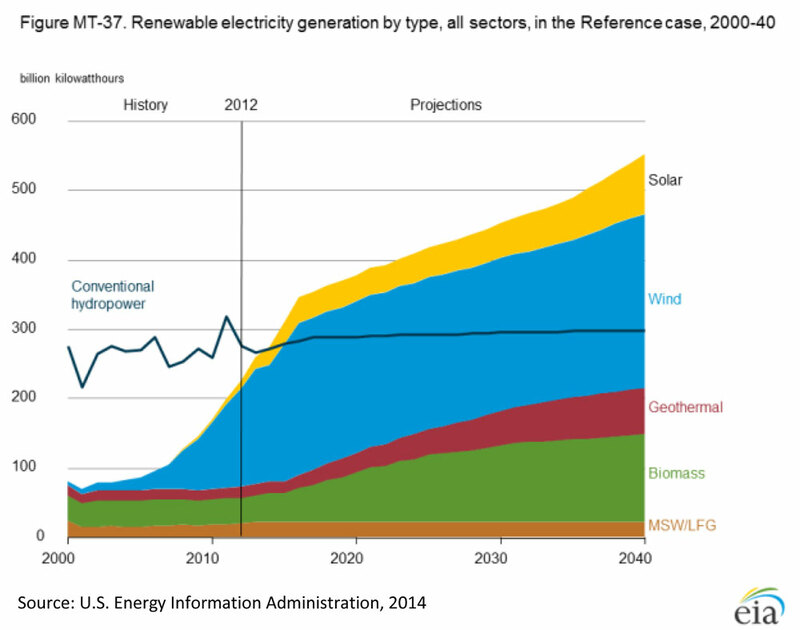 Wind and solar have grown rapidly, seen prices drop and are in demand. However, energy efficiency may be a better bet. Biofuels, hydro and geothermal present their own environmental problems: biofuels, or extracting energy from fermented biological matter, runs into conflicts over land use. Water is a limited resource and most of the big hydro sources are already developed. Geothermal is very expensive, location specific and can release greenhouse gases. Over all, renewables are a tiny part of the energy market. They make up only about 5% of global energy generation and compete with cheap, seemingly endless supplies of natural gas, which burns more cleanly than oil or coal. But wind, and especially solar, have grown at a rapid pace—and prices have fallen enough to compete with fossil fuels in some states and countries. The growth in both renewables was driven primarily by government subsidies, but gridlock in Washington and a Republican Congress backed by fossil fuel interests are clouding the picture for these incentives. This is leaving wind power in more of a lurch than solar, because its Production Tax Credit expired at the end of 2013. The market stalled out in that year and continues to sputter. But prices have fallen 63% in the last five years, and growth is expected to double by 2020 and again by 2030, according to the American Wind Energy Association. The biggest makers of wind turbines are GE, Siemens Wind, based in Europe, and pure play, Vestus, a Danish company. “Wind energy is bigger than solar, but solar is growing faster,” says Elias Moosa, portfolio manager at asset company EcoAlpha. 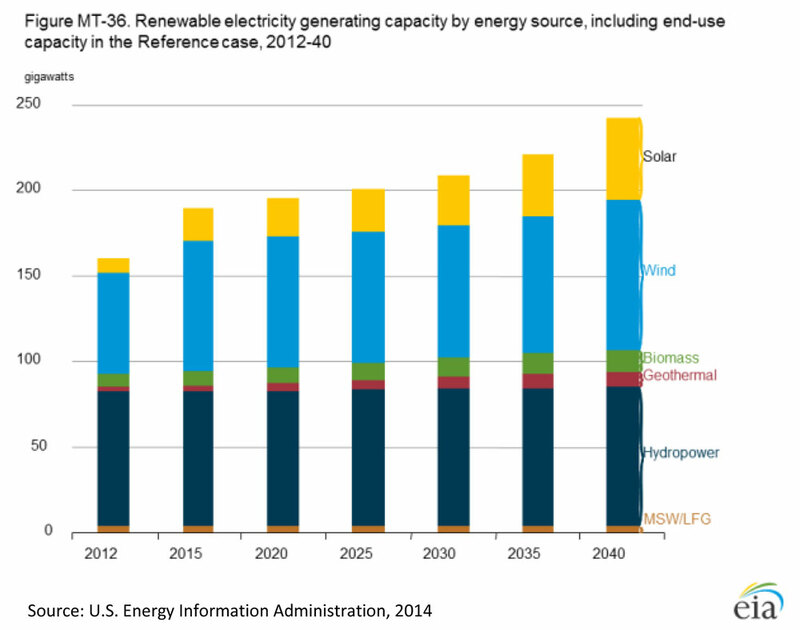 The federal subsidy for solar is set to last through 2016 and then gradually decrease. But solar may not need it as much. While still only a fraction of all energy, solar is the second most rapidly growing source of new power generation in the U.S., behind natural gas, according to the Solar Energy Industries Association. The total global installation of solar panels has risen from 6.6 gigawatts of electricity in 2008 to 40 GW in 2013. Bloomberg New Energy Finance (BNEF) predicts growth will top 60 GW in 2016, according to Moosa. Prices have fallen by 70% since 2010, and solar is only five to six cents more expensive than coal. Four bigger solar companies are First Solar, SunEdison, SunPower and Solarcity. Edward Guinness of the Guinness Atkinson Alternative Energy mutual fund particularly likes Enphase, which makes solar microinverters, each of which acts independently to maximize sun exposure and limit damage. He also likes low-cost Chinese manufacturers and installers including Trina, Jinko and China Sing Yes. Most experts agree that the renewables market is still in its infancy and so volatile that individual companies are too risky. Guinness Atkinson, Firsthand and Calvert Global Alternative Energy are pure-play mutual funds that offer diversification and manager expertise. ETFs focused on renewables include offerings by Guggenheim. Powershares, First Trust and Market Vectors. These, too, are subject to the boom-bust cycles of this industry. A better way to invest may be through the more stable subsector of companies that increase energy efficiency. These can be anything from LED lighting manufacturers to makers of sensors that turn off electronics when they’re not in use. Demand response companies like EnerNOC allow consumers to manage electricity usage for the greatest savings. Perhaps the most intriguing investments to come out of renewables are yieldcos. Most solar and wind projects are financed via power purchase agreements, or contracts, allowing energy purchasers to pay off installation costs over 20-30 years. This creates a stable income stream for the renewables companies. And this is why Warren Buffett is in the business. Like REITs or MLPs, yieldcos separate that steady income from the riskier R&D and construction parts of the companies. They trade on public exchanges and pay out dividends generally in the 3% to 5% range. In this low-interest rate environment, they have been in great demand. “The speed of money raised in new issues is phenomenal,” says Guinness. Two yieldcos are SunEdison’s TerraPower, holding bundled assets from the U.S., U.K., Canada and Chile, and NextEra Energy’s NextEra Energy Partners. Guinness warns that yieldcos are sensitive to rising interest rates and must keep acquiring new projects to grow. They are also only a bit more than a year old and as yet unproven. Another subsector to keep an eye on is energy storage, or batteries—the holy grail of renewable energy. Batteries would store solar and wind energy so they can deliver even when the sun doesn’t shine or the wind, blow. However so far, the cost is prohibitive. “The cost needs to come down,” says Moosa. He thinks that will take is at least 10 years. The most promising companies there are Panasonic for developing lithium ion batteries and Toyota for fuel cell batteries. – Check out more Energy Investing stories on ThinkAdvisor.